The above photograph, showing a brief moment of Aussie triumph, does not adequately sum up the kind of evening England fans had this past Monday. The picture at the bottom of this post probably a better indicator. 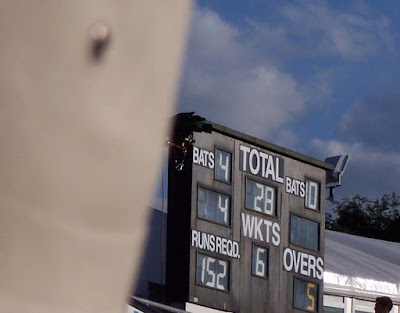 I'm not going to bang on about the game, because it has been documented more than adequately elsewhere, but despite the quickfire nature of the game, to witness Australia slipping from 23-0 to 31-7 in the space of 20 balls, is something you would never expect. Hats off to Darren Gough and Jon Lewis, and latterly Paul Collingwood, who bowled superbly, putting Australia firmly on the backfoot in a game where positivity is the only way to victory. The steady but not scene-stealing contributions from the batsmen should also be noted. What a game though. It was always going to be a freak show, but for the Aussies in the first international tussle on their long tour, it was particularly grotesque. This result means precisely nothing in terms of what the Ashes will bring out of both teams, but a firm psychological blow is always useful. 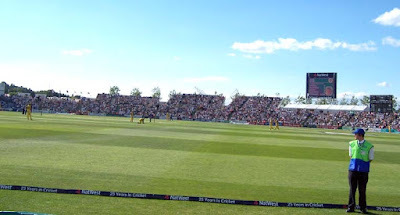 Ricky Ponting's claim that the England side were more used to the format didn't wash either as thanks to their practice game at Arundel, their thrash with New Zealand earlier in the year, the amount of Australians in county cricket and the nature of ECB central contracting meant that the Aussie side had, on average, more experience at it than England, man for man. It was more than just the result though, this was a huge game for the Rose Bowl and the people of Hampshire. 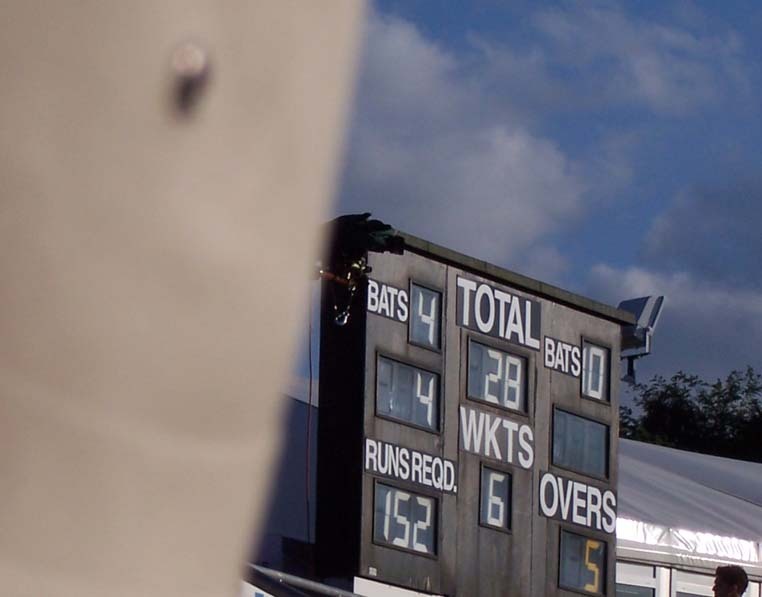 The biggest game thus far held at Hedge End. While it is easy to take issue with the Rose Bowl pitch, which after 5 years has still to bed in properly and is not conducive to high-scoring with the bat, everything else about the place is marvellous. 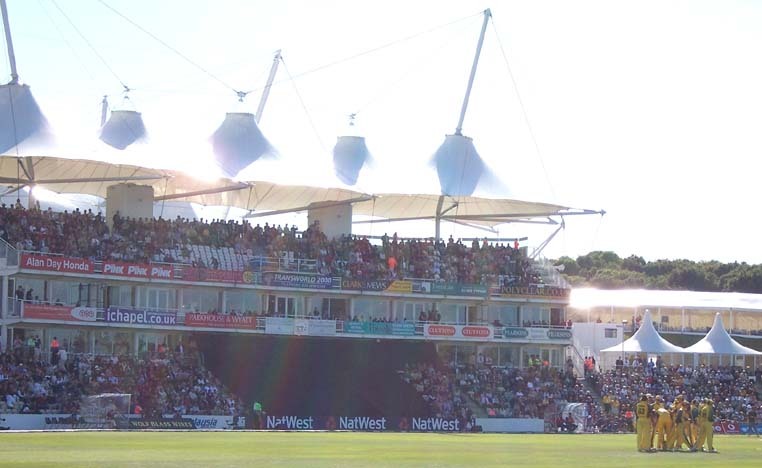 The pavilion looks stunning and the 'dug-out' nature of the field makes for fine viewing all round. I love the place, and would do regardless of my county allegiance. 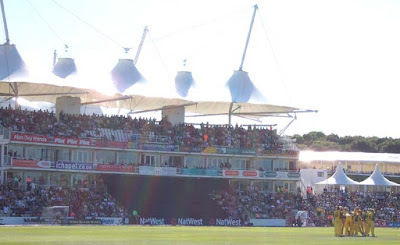 With all the 9,000 regular seats of the bowl filled and an extra 6,000 temporary seats set up on the walkway at the top eagerly snapped up, the place looked and felt amazing, and the atmosphere was electric. 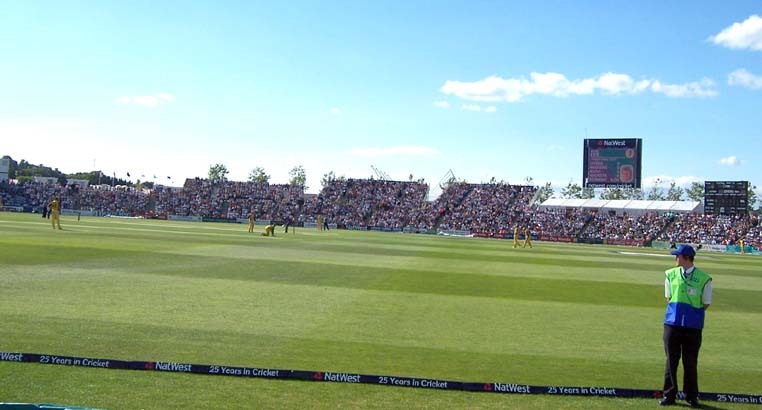 This was probably helped by the fact that the gates had opened 6.5 hours prior to the England/Oz clash and had included a PCA Masters v Hampshire game on the undercard. Good too that this game went down to the last ball before Hampshire could wrap up victory. Robin Smith and Devon Malcolm back in the same side, great days! Certainly, the Rose Bowl isn't quite ready for a Test yet, but further one-day and, particularly, Twenty20 internationals (as they are inevitable) are richly deserved, as transport problems from last years ICC Trophy ties were ironed out, and other issues of toilets and refreshments will no doubt be looked at. Regardless of the merits of this contest, this result bodes well for an exciting summer where England can offer more than just getting in the way of the Aussie juggernaut. Loads of work to do, but things seem possible, and that is a rare position for English cricket going into an Ashes summer.